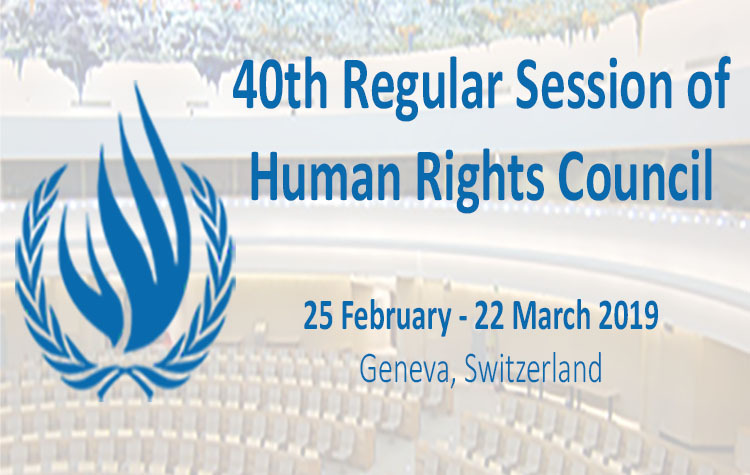 Twenty years after the United Nations adopted the ‘Declaration on the Right and Responsibility of Individuals, Groups and Organs of Society to Promote and Protect Universally Recognized Human Rights and Fundamental Freedoms’, both the Declaration and HRDs are being attacked continuously around the world. In Indonesia, many HRDs were silenced, attacked, criminalised, or even murdered. Munir Said Thalib, Marsinah, Wiji Thukul, and Udin Bernas are among many Indonesian HRDs who became victims of human rights violations. One of the main reasons of continuous attacks against HRDs is the lack of public understanding on the Declaration on HRDs and the profile of HRDs. Therefore, it is important for everyone to be aware and understand the Declaration on HRDs, and what kind of role that can be taken by all of us to further advance and protect human rights. Aside from celebrating the 20th anniversary of the Declaration on HRD, the year 2018 also coincides with the 70th anniversary of Universal Declaration on Human Rights (UDHR). In relation to these commemorations, Michel Forst, a UN Special Rapporteur, is conducting a public academic lecture on the situation of HRDs at Universitas Katolik Indonesia Atma Jaya. This event will be co-hosted by the Atma Jaya Catholic University, FORUM-ASIA, the Commission for the Disappeared and Victims of Violence (KontraS), and Indonesia Legal Aid Foundation (YLBHI). The objectives of this activity are to educate students and the public about the Declaration and HRDs; to raise awareness on the roles of HRDs; and to provide a learning and dialogue space with the UNSR on situation of HRD, including but not limited to discuss general human rights situation, the UNSR’s mandate, Asia and global HRDs situation. 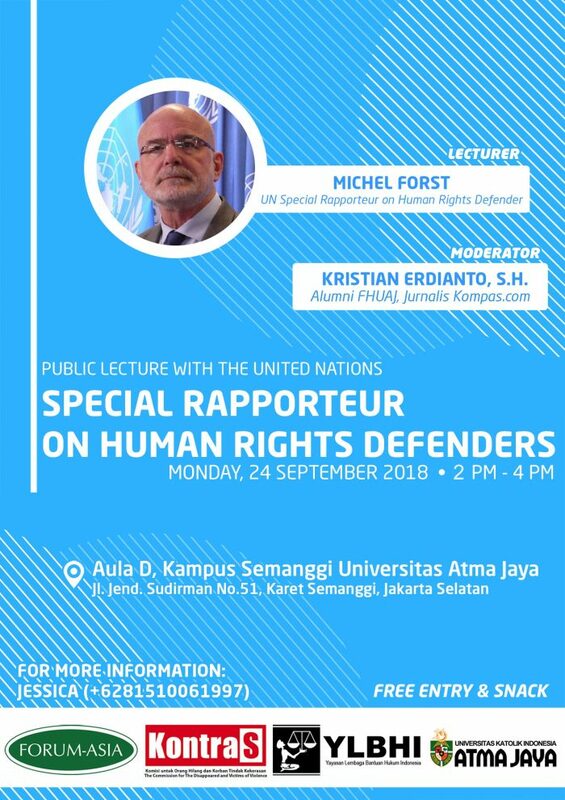 Join the public lecture on the situation of HRDs with the Special Rapporteur, Mr. Michel Forst, on Monday 24 September 2018 at 14:00 at Hall D, Atma Jaya Catholic University of Indonesia, Jakarta. Ms. Fatia Maulidiyanti at fatia@kontras.org, +62 819 1309 1992. From 2008 to 2013, Mr. Forst was the UN Independent Expert on the situation of human rights in Haiti, and between 2012 and 2013 he was the Chair of the Coordination Committee of the Special Procedures of the Human Rights Council. He is also a former member of the Board of the International Service for Human Rights (Geneva) and a founding member of Front Line Defenders (Dublin). FORUM-ASIA is a network of human rights organisations across Asia. It works to promote and protect human rights, including the right to development, through collaboration and cooperation among human rights organisations and defenders in Asia and beyond. Indonesia Legal Aid Foundation (YLBHI) was established in 1970 with the vision and mission of establishing democracy and human rights, which lies upon a just, humane and democratic socio-legal system; a fair and transparent institutionalised legal-administrative system; an open political-economic system with a culture that fully respects human rights.